Investors with employer-sponsored retirement plans have the option to take out a 401k loan against the money in their retirement account. The decision to borrow on a 401k loan is a hotly-debated topic and you should weigh all the drawbacks carefully. A 401k loan may seem like a nice way for the government to provide you with emergency income, but the rigid rules that apply to 401k loans make them a wise option for only a small percentage of investors. Use this quick guide to see if a 401k loan is right for you. IRS and employer regulations stipulate that only $50,000 – or 50% of the account’s value, can be taken as a 401k loan. The loan must be repaid in full within 5 years, and you have to pay interest on the borrowed money even though it was your money to begin with. On the plus side, the interest you pay is usually at or around the prime rate, so a 401k loan might be a better option than a home equity loan, a payday loan or a credit card. The interest you pay will go back into your account, but with interest rates so low you could easily lose big if you borrow from your 401k instead of leaving it alone and letting it grow. If you have job security concerns then a 401k loan may not be the best idea. Your 401k loan must be paid back immediately if your employment with the 401k sponsor ends, and if you can’t make the full payment then the balance will count as taxable income for the fiscal year in question. This is one of the biggest drawbacks to a 401k loan and catches most people off-guard. With layoffs and downsizing more present in the workforce than ever before, it’s increasingly difficult to find the job security we all used to count on. 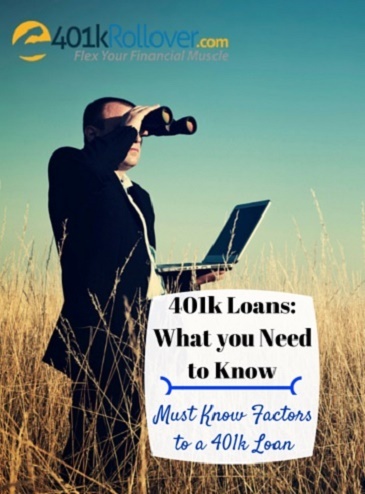 If you are caught in the situation where you need to immediately repay a 401k loan, you may be forced into taking another type of loan at higher rates. If you are younger than 59 ½ and find yourself missing payments on a 401k loan, the proposition is even worse because you will have to pay a 10% early 401k withdrawal penalty. The combination of having an outstanding 401k loan, being jobless, possibly being pushed into a higher tax bracket and sustaining an IRS penalty is not a hole that most people can get out of quickly. Your employer may match 401k contributions up to 50%, but if you take out a 401k loan you will lose the ability to make your own maximum contribution. Matching is a big advantage of 401k plans so losing the benefit is not something to take lightly. Since a 401k loan must be repaid within five years, it limits the amount you can safely withdraw. If you might not be able to repay the loan over the five-year period, consider other types of loans or ways to come up with the money. Even at higher rates, other types of loans may be a better choice if you can avoid the taxes, penalties and missed employer matching that comes from a defaulted 401k loan. A loan against your 401k retirement account comes with the advantage of being a lower rate than other loans and some persuasive benefits but it may be more trouble than it’s worth. Make sure you weigh all the hidden costs like missed employer matching and the potential for taxes and heavy penalties. If you are suffering hardship from medical bills or other debts that just can’t be paid, you may qualify for a hardship withdrawal. You will still pay taxes on the amount withdrawn but will avoid penalties and can take out only the amount you need. To put it simply, a 401k loan is easy to execute and people do it every day but if you have low job security, need a very large loan, need a long-term loan and/or are relatively young then a 401k loan should be one of the last options on your list of places to create liquidity.